A gun that shoots champagne? A gun that shoots champagne. Aren’t you tired of spraying celebratory champagne everywhere by keeping your thumb on the mouth of the bottle? Not to worry — the champagne gun is a gadget that helps you waste more champagne more efficiently by spraying a steady stream of bubbly in any direction you choose. 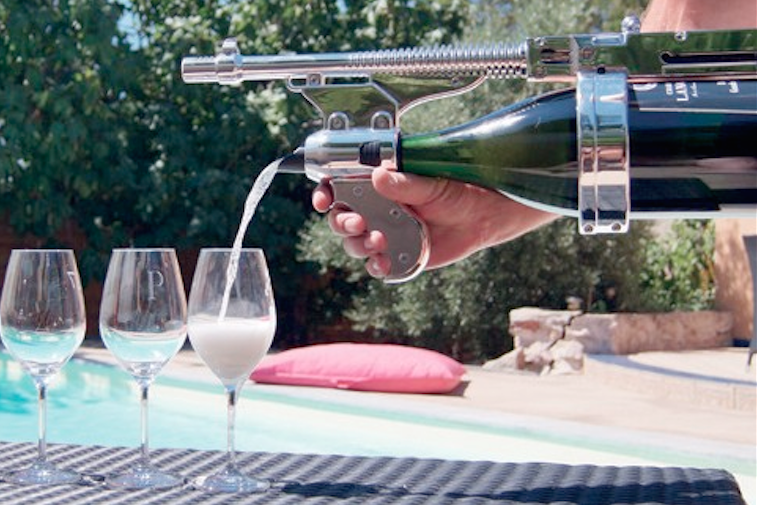 The champagne gun also comes with a “champagne service” attachment, so that the next time you pour a magnum bottle around the table, you could be pouring it from a gun-inspired holder. The champagne gun itself weighs five pounds, and is made of a metal structure in a plastic shell, coated with a “high quality” metal finish. It works with any magnum bottle, which means you’re blasting 1.5 liters of champagne at a radius of 16-23 feet for about 45 seconds each time you use it. Prefer to tone it down a notch? If the diffuser works up too much spray for your personal taste, you can also use the spout attachment to pour champagne in much the same way you used to pour from the actual bottle before you laid eyes on the champagne gun. For obvious reasons, some people seem to think that pouring champagne into a glass or another thirsty person’s mouth is more fun when the bottle holder looks like a gun. Of course, the champagne gun comes in gold, rose gold, and chrome finishes, and it costs $459, down from the original price of $499. The creators of the gizmo seem to think the savings are worth the luxury status statement made by owning your own champagne gun. In addition to the bigger champagne spray mess you’ll have to clean up and the unnecessary champagne pouring accessory, the champagne gun’s third function is as a display item, to prop up your magnum bottle in a gun-shaped stand for the world to see. Cheers.